I’ve got a super simple, healthy and ridiculously flavorful dinner for you! Riiiight here. Cue all the exclamation points. Cajun salmon for the win! I often wonder if literary scholars, English teachers and excellent writers in general still believe in the you-only-have-one-exclamation-point,-use-it-well rule now that it’s 2016 and the internet rules the world. Self expression in the form of exclamation points is very important, FYI. Also, self experssion in the form of exclamation points is a huge crutch. And also the worst. But the best. How else would you know that this salmon is i!n!c!r!e!d!i!b!l!e!? And for the record, he ALWAYS “just ate.” Always. It’s very inconvenient when my brain is lazy. As a huge salmon lover, I’m always trying to find new favorite ways to flavor it. Eddie is not much of a salmon lover these days – I think he used to be, perhaps I served him one too many dried-out filets? Guilty. It’s that, combined with loving burgers and pizza too much. He isn’t into it. So I was determined to make some spicy, flavorful salmon that he’d love and that chicken pot was my inspiration. Problem though: I was completely out of cajun seasoning. I threw together a makeshift one of my own that was delish and might keep me from buying the bottled stuff from now on. I also made a boatload of it and Eddie has been sprinkling it on every bite of food he has put into his mouth since last week. This buttery fish is topped with so much delicious spice that your taste buds will straight up lose.it. And then! It’s topped with even more flavor as you scoop on a touch of salty lime butter while it’s still hot. It melts all over and runs down the sides and is worthy of so much more than one exclamation point, I swear. Big bonus: it’s probably going to take you way less than 30 minutes – the most time consuming step will be measuring out your spices. Serve it with some rice and/or asparagus or something springlike and lovely. Thumbs up! Place the salmon on a baking sheet and brush it with the grapeseed oil. If desired, you can rub it with 1 tablespoon of the lime butter instead (or in addition to, for flavor). In a bowl, stir together the paprika, italian seasoning, salt, pepper, garlic, onion powder, pepper flakes and cayenne. Sprinkle it evenly over the top of the salmon filet and press gently to adhere. Broil the salmon for 6 to 8 minutes, or until just opaque and flakey with a fork. Remove from the oven and cover with a few teaspoons of the lime butter. Serve with rice and lime wedges for spritzing. Stir together the butter, lime zest and salt until combined. I don’t really eat/enjoy fish, but this looks SO good. I’ve been trying to eat more fish as of late, but growing up with a vegetarian mom meant I never really had fish until high school/college. Trying to add more to my diet and I think this is a good way to start! Omg my husband always give me the “I just ate, I can’t think of any other meals now” excuse all the time! It probably doesn’t help that I’m constantly planning our next meals. This looks incredible! I’m obsessed with the salmon recipe from your book and it’s the only way I make salmon now but I have to try this one! ah thanks mary!! so glad you like the recipe in the book! Hahaha, I think those English teachers have given up on it a looooong time ago!!!! Haha. I am one of those English teachers!! Anyhow, this fish looks like the fish we ordered while on vacation in Florida, but that was $30 bucks. Each. What kind of rice did you use? It looks so good! it’s trader joe’s brown jasmine rice! so good, my fave. I know what I’m having for dinner tonight!! this looks amazing! i did! i don’t always, sometimes i use foil or sometimes i just do it on the sheet. i make sure the parchment is fitted on the sheet and sometimes i even rub a little oil on the sheet so it kinda stays “glued” down? I do watch it the entire time though! My husband just requested cajun salmon for dinner! I made it on Monday and did a mix of cumin (my absolute FAVE), smoked paprika, onion powder, chili powder, S&P… it’s so simple and totally delicious. But I’m thinking this salted lime butter is a must for next time. And I’m usually talking about what I am going to eat for my next meal while I’m currently eating this meal… why can’t the guys do the same?! Yes yes yes! Totally making this for dinner tonight! Just made it. Oh my gracious!!! SO GOOD! I’ll definitely be making it again. I loved the char on the salmon. Beautiful!!! It is cooked to perfection and the proof lies in the pictures. Look at the juicy center of torn fish part. Hope I could cook with such a perfection. Well done. My husband also gives me the “I’m full, just ate I can’t think of food right now” and of course drives me nuts, b/c I try to do as much meal planning as possible and that answer doesn’t help the situation. 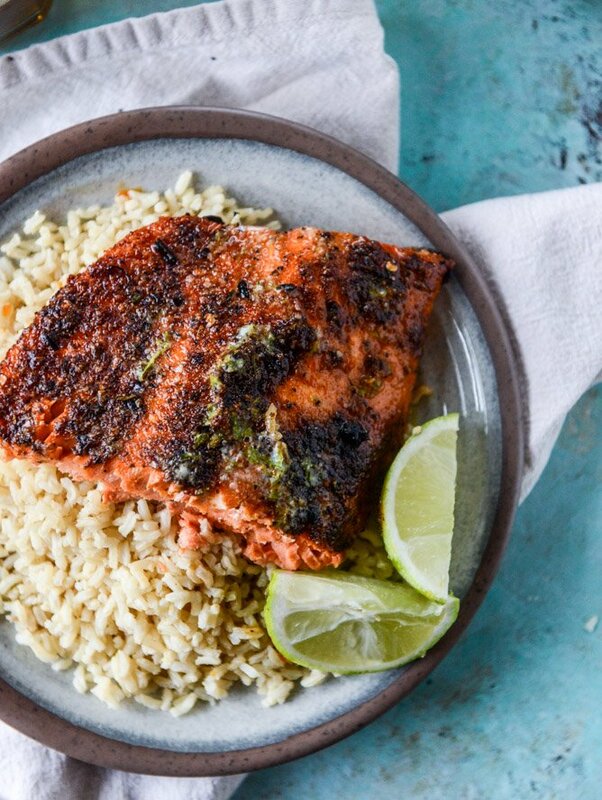 We are salmon lovers at the house, and we love all your salmon recipes so this one is going to happen tomorrow for dinner. I already had salmon on my meal plan, but undecided which way to make it. Thank you for recipes taking 30 mins or less. Favorite la croix flavor, probably pamplemousse or berry. Can’t decide. Right now I have a can half way in my fridge (covered) hoping it still has fuzz when I get home and I can’t even recall what flavor it is. My mom makes a delicious salmon! She spreads a layer of mayo on it, a light sprinkling of soy across it, and Cajun seasoning on top, then put under broiler until cooked! SOOOO GOOD!!!!! this sounds so delicious – i think i need to do it! I’m definitely making this and a giant pitcher of margaritas this weekend! This looks amazing! haha! pie for dinner, yes please. Every time I see you make salmon it makes me so sad because I don’t like salmon and it looks so tasty! Made it tonight, delicious! full of flavor and I had leftover cajun spices (doble the batch) and salted lime butter. Love recipes like this! Not complicated and amazing results. Perfect for weeknights. so glad you liked it blanca!! I have actually never cooked with salmon before, but I definitely want to! This looks perfect! This looks delicious and I must try it. This looks absolutely easy and incredible!! Pinning and making! This was so unbelievably delicious and ridiculously easy!! I won’t be having salmon any other way anytime soon. Thanks for the great recipe, as always! so glad you liked it danielle! I have evoo, of course, but no grapeseed oil. Can I use olive oil in lieu of grapeseed without drastically impacting the flavor? I made this for dinner tonight and it was phenomenal!!! Seriously some of the best salmon I’ve ever had and I’ve had A LOT of salmon haha. Thanks for the recipe Jess! so glad you liked it molly! Thank you for such an easy and delicious meal! I’ve never broiled salmon before and it was ah-mazing but its that salted lime butter I can’t stop thinking of….seriously, what else can I put it on?! I didn’t think I liked salmon, but this was incredible! Every recipe I’ve made of yours is fantastic! I just made this tonight and it was dynamite. I also put that Cajun seasoning on some chicken for the people I live with that don’t do fish and they loved it! I’m definitely saving this recipe! could you use olive oil as a substitute for the grapeseed oil? I made this the other night and it was delicious! I love how quick and easy it was too. I’m always looking for new salmon recipes and this one is definitely a keeper. Thanks for sharing! This was SO GOOD!!!! We grilled our salmon instead of broiling and I couldn’t get enough. So simple, so delicious! I’m not always a salmon lover either — I need a good recipe to enjoy it, and this is definitely it! Thank you! This is one of my favourite recipes from your website. Sooo good. Don’t skip the salted lime butter! It totally makes everything. Have made this a number of times and it is excellent! My cooking time varies drastically from what you recommend (and we love our salmon medium-rare), but the flavor cannot be beat. Thank you for sharing! Can frozen salmon be used for this recipe?